Get your winter fun fix while exploring Alaska&apos;s unique landscape, culture and heritage with this sample winter vacation itinerary. Moderate temperatures and long spring daylight hours provide ideal conditions for winter play. Check out Alaska Winter Activities for more Alaska winter vacation ideas and top Alaska winter destinations. 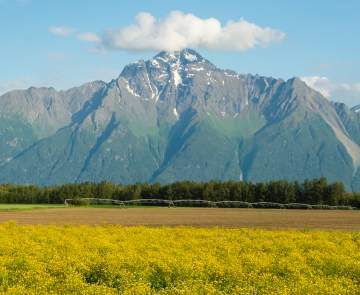 Drive the Glenn Highway through Palmer to a scenic mountain lodge. 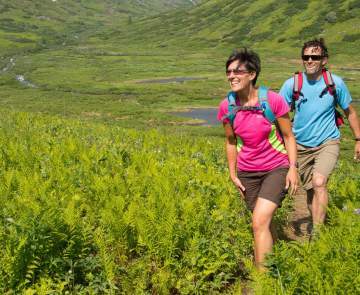 Rent skis or snowshoes (many lodges provide complimentary gear), glide or trek through pristine snow for breathtaking views of the Chugach and Talkeetna Mountains. Relax and enjoy a gourmet dinner, outdoor sauna or curl up in your cozy lodge room. 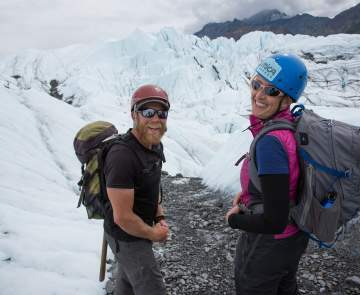 Ice fish for land-locked salmon, fly over glaciers or Denali and visit a local museum. The day is yours, the list is endless. Travel to Wasilla and visit the Iditarod Trail Sled Dog Race Headquarters and then tour a genuine sled dog kennel. Meet Iditarod mushers, their future champion sled dog pups and learn how to mush a dog sled team. Overnight in Wasilla or Willow. Ride deep into pristine Alaska backcountry by snowmobile and carve trail through some of the worlds most scenic and wilderness terrain. Snowmobile tours and rentals available throughout the Mat-Su Valley. Fly out to a remote wilderness lodge and surround yourself in the serenity of Alaska wilderness as you feast on a gourmet meal and watch for the northern lights.